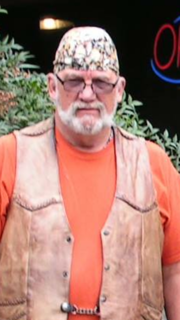 Mr. David “Hillbilly” Ross Elston, 67, of Southaven, MS, passed away Sunday, March 25, 2018 at North Delta Hospice, located in Southaven. Mr. Elston was a delivery driver and an over the road truck driver most of his adult life. While driving over the country, he enjoyed documenting his journey and trips through photography. During his high school career, he was a member of the football team, as well as a member of junior ROTC. After high school, Mr. Elston joined the United States Army National Guard, where he served six years on reserve. He had a very unique sense of humor and was quite the jokester and prankster. In the early ‘70s, he was a drummer for a small band. This helped fuel his love for music especially bluegrass, country, and a little rock ‘n roll. During the ‘80s, he was a member of the jeep club known as “The D’s”. Mr. Elston loved the outdoors, whether is was gardening, camping, hunting, or fishing, you could certainly count him in. He enjoyed watching country westerns starring John Wayne, and watching M.A.S.H. He also enjoyed talking on the phone, drawing, crafting, and especially woodworking. Mr. Elston never met a stranger and loved his friends as if they were family. He was an animal lover and loved his dogs tremendously. He was a member of the Law Dogs – Delta Chapter, which is a law enforcement motorcycle club. Mr. Elston was known for having a sweet tooth and always enjoyed old fashion liquorish. He loved to grill and smoke meat, he even made his own BBQ rub and sauce. He was a selfless soul, always ready to help others when needed, and throughout the years he became more sentimental the older he got. Mr. Elston was a true southern gentleman, a simple man with extravagant taste. His memory will continue to be cherished through the many memories he made with family and friends. Mr. Elston leaves behind his loving companion of twenty-one years, Brenda Lee Crawford of Memphis, TN; three daughters, Christina Hutcherson (Scott) of Covington, TN, Kelly Elston (Shane) of Southaven, MS; Kim Fresh (James) of Cordova, TN; four grandchildren, Rebecca Hutcherson, Chelsea Hutcherson, and Andrew Hutcherson all of Covington, and Hadin Elston Johnson of Southaven; three grand-fur babies, Roxy, Bella, and Lulu. Mr. Elston also leaves behind a host of other family and friends. He was preceded in death by his parents, Manly Floyd and Lou Eva Elston. In lieu of flowers, the family asks that donations and memorials in honor of Mr. David “Hillbilly” Ross Elston, be made to the American Cancer Society (P.O. Box 22478, Oklahoma City, OK 73123). A visitation will be held Friday, March 30, 2018, from 1:00 P.M. – 3:00 P.M. at Twin Oaks Funeral Home (290 Goodman Rd E; Southaven, MS 38671). A celebration of life will be held at 876 Charter Oak Drive, Southaven, MS 38671, following the visitation. Brenda, Christina, Kelly + Kim; When your Dad & Billy Max led our motorcycle group on rides…their rapid fire remarks, stories, barbs at each other… always were a delight & made our travel more interesting!!! So sorry for your loss. David will be missed. I have many fond memories from when we were younger and the summers hanging out as cousins do at the lake. Thoughts and prayers for all during this time. always enjoyed the motorcycle rides with david. he had such wonderful tales. we will miss him alot. Sorry for your loss. I will be praying for the family. David was a very special person and will be missed by many people!!! Sorry for your loss. David was a great guy. Our prayers and condolences are with you in this time of loss. Bob and I are praying for your family to be held by God’s hand and comforted by His grace.